My current 'Wish/Lust' list for Spring 2012. Here is part 1- its parts neutrals and brights. I would be the happiest girl if these bright slacks and dress were in my closet, like now! (These sadly had to go back, they din't work on me at all! Off to the races, looking again for a wide leg colored slack!) Then toss in the center 'neutral' items - and a fabulous candle because who doesn't need an other?! Are you going for a bright or light spring?! That ring. Those pants. I'm DYING. Great minds think a like! Have you seen the bright red wide leg slacks at Ann Taylor Loft? I just purchased them and I LOVE THEM!! It's a part of their new spring line but I actually got them for around $55 because they were running a sale (score!) You must check them out! I don't think they will be around forever!!! The Anthro dress is stunning! Yes, all of these must be fine. Those sandals are ridiculously perfect! I've been eying that chloe bag for months. I really think I need it. Ooh I like those pants! I Loooove those sandals! So perfect! I love everything, especially that dress. 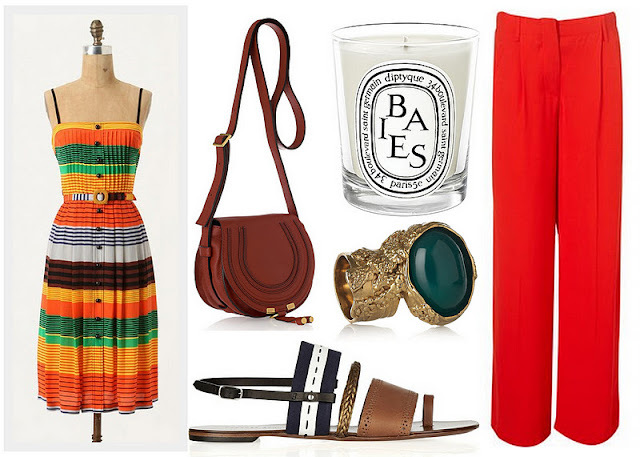 I'm getting excited for spring now :) And I'm dying to try one of those diptyque candles. Oh those pants! So fun. yes to the pants and the ring and the sandals...ok ALL of it!! That dress is seriously fabulous! I'm equally obsessed with bright and pastels...so I'll be rockin' both! I love that candle and of course, a Chloe bag is always a nice touch. Haha. i was late getting on the bright train this fall/winter, so i think i might pick up a few pairs of colored denim/slacks, but i am really craving pastels for spring. i want to deck my self in after-dinner-mint hues! so to sum that up - brights and pastels! thanks for sharing - those pants are fab! been wanting those red trousers!